Italy’s post-war ‘economic miracle’ brought dramatic changes to the lives of all Italians. For women these changes were, in many ways, revolutionary. Italy’s mass culture boom provided women with information and a range of opinions on their changing role in society, which both challenged and reinforced the influence of the family, state and church. 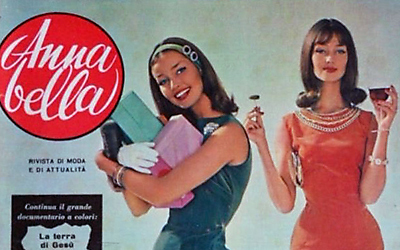 Young Italian women had a whole new world before them, and magazines provided information and ideas about it. The paper examines the distribution of different magazines by class and region to explore Italian women’s access to ideas about the modern world. Emma Barron is a cultural historian. Her recent book Popular High Culture in Italian media 1950-1970: Mona Lisa Covergirl (Cham, Switzerland: Palgrave Macmillan, 2018) examined the reception of magazines and television to show that high culture was integrated into Italy’s mass culture boom in distinctive ways. She teaches European film and history in the Department of History at the University of Sydney and is an Honorary Research Associate at the Australasian Centre for Italian Studies. Emma completed a history PhD in co-tutelle at the University of Sydney and the University of Bologna in 2016.